English author and teacher; born in London, November 26, 1858; son of Barnett Abrahams. He received his education at Jews' College, of which his father was principal, and at University College, London. He received the degree of M.A. from the University of London in 1881. Abrahams taught secular subjects as well as homiletics at Jews' College, and was appointed senior tutor of that institution in 1900. He is a forceful lecturer and an earnest lay preacher. As honorary secretary of the Jewish Historical Society of England and as a member of the Committee for Training Jewish Teachers, he has been very active. He is also a member of the Committee of the Anglo-Jewish Association, and of several other institutions of the community. 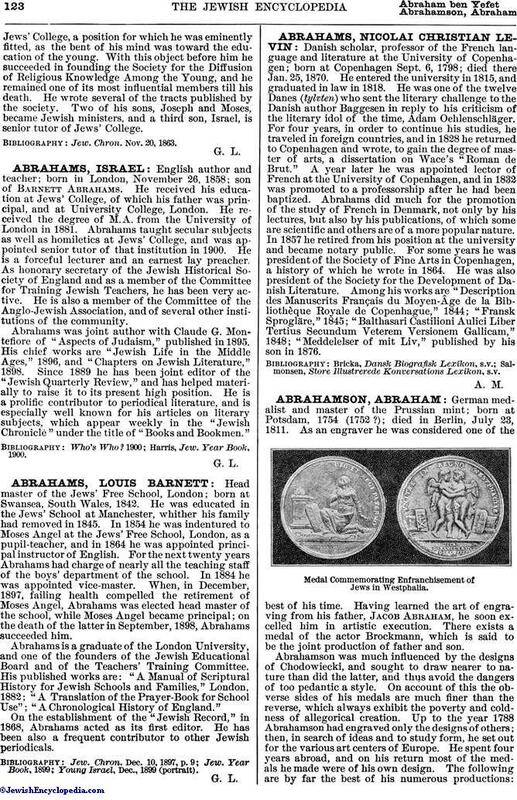 Abrahams was joint author with Claude G. Montefiore of "Aspects of Judaism," published in 1895. His chief works are "Jewish Life in the Middle Ages," 1896, and "Chapters on Jewish Literature," 1898. Since 1889 he has been joint editor of the "Jewish Quarterly Review," and has helped materially to raise it to its present high position. He is a prolific contributor to periodical literature, and is especially well known for his articles on literary subjects, which appear weekly in the "Jewish Chronicle" under the title of "Books and Bookmen." Harris, Jew. Year Book, 1900.